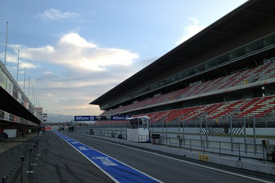 07:40 Good morning and welcome to a dry, but still cold, Barcelona for day three of Formula 1's final pre-season test of 2013. 07:47 This is the view of the Barcelona pitlane this morning. The grey skies of the past two days are a thing of the past, so there should be plenty of opportunity for 'proper' race simulations today. 07:51 Already a bit of a delay at Williams this morning, which has been entertainingly documented by the tweets of team manager Dickie Stanford. He arrived at 6am to greet a van carrying new car parts, only to see the van not arrive until almost 8:30. Let's see whether that affects the team's plan today. 07:53 Some breaking news courtesy of @noblef1. 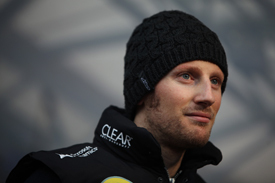 Kimi Raikkonen is ill and will be replaced by Lotus reserve driver Davide Valsecchi this morning. Romain Grosjean, who finished his pre-season programme yesterday, has been told to turn around and come back to the track. He is due at Barcelona this afternoon. 08:01 The green flags are out and we're underway. 08:04 Jean-Eric Vergne's Toro Rosso is the first car out on the circuit and instantly he's conducting constant-speed runs, as is Sergio Perez in the McLaren. 08:08 Installation laps are the name of the game at this early stage of the day. No flying laps completed. 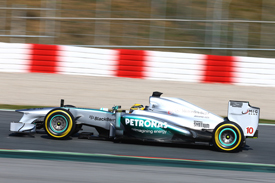 Lewis Hamilton and Esteban Gutierrez are the two men currently on-track. 08:17 Last night was a busy one with the driver goings-on at Marussia. 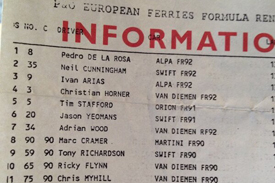 Amusingly several drivers were linked with the seat during the day. Heikki Kovalainen was about the most sensible, although Pedro de la Rosa and even Mika Salo were mentioned in the press room. 08:18 Jules Bianchi, the man eventually confirmed as Max Chilton's team-mate, has just ventured onto the track for his first run in the MR02, and is, as expected, conducting a constant-speed run over the start/finish line. 08:24 The photographers are enjoying the light levels at the moment, all of which help their photos look a bit more arty. Here's an early one of Perez's McLaren from Turn 5 this morning. 08:28 All morning we're inviting you to put your questions to AUTOSPORT technical expert Craig Scarborough, who will be sitting down to answer them this afternoon. You can tweet questions to @autosportlive #Askscarbs or email live@autosport.com. 08:29 Perez sets the first time of the day on a 1m26.459s. 08:30 That marker doesn't last long as Hamilton is immediatley into the 1m23s, 3s faster than the Mexican. 08:33 Van der Garde and Vergne are both out on the track too, as are Gutierrez and Bianchi. None have gone as fast as Hamilton though. 08:38 Massa breaks the 'mediums only' strategy employed so far this morning by going out on a set of red-marked supersofts. 08:41 Air temperature is 9 deg right now with a track temperature of 12 deg. Expect that to rise rapidly as the sun climbs higher in the sky. 08:43 @lotus_F1team: We can officially deny any made-up reports that #Kimi was out partying with HRH Queen Elizabeth II. 08:48 Here's the first picture of Jules Bianchi driving a Marussia. If he were English, his name would be Julian White. Doesn't sound anything like as fast, does it? 08:50 @mycaterhamf1: Front ride-height and front wing flap adjustments for Giedo before his next run. 08:58 Vergne is out on another run and goes up to second, having knocked three seconds off his best from half an hour ago. 09:01 Mark Webber heads out as Adrian Sutil pits. Red Bull team manager Jonathan Wheatley wandered up to the press room earlier and spent a little while peering out of the window directly above his team's garage. Concerned at what new parts the paddock spies might be able to catch a glimpse of perhaps? 09:03 With an hour gone Hamilton leads by 0.7s from Vergne with Perez third. Hamilton has completed 16 laps, more than anybody else today. Sutil, Bianchi, Webber and Valsecchi have all been on the track, but have not completed any flying laps. 09:09 Massa jumps up to third with a 1m25.2, an improvement of over a second from the Brazilian. 09:12 @pedrodelarosa1: F Renault Championship 1992. Look who finished 4th! 09:14 Gutierrez improves too. A 1m27.8 becomes a 1m25.3. He's now fourth. 09:18 The longest stint of the morning so far has been a 13-lapper from Hamilton, featuring nine flying laps. 09:20 Remember to send in your questions for technical guru Craig Scarborough, who will be joining us for 'Ask Scarbs' this afternoon. Tweet your questions to @autosportlive #AskScarbs or email live@autosport.com. 09:22 Sutil has officially clocked-up 10 laps this morning, although none of them have been fliers. Force India's mechanics are currently using the time to practice race-style pitstops. 09:28 Hamilton sets a blistering pace at the front. A 1m21.534s lap to put himself 2.5s clear of Vergne. 09:31 That's the fastest lap time set at Barcelona this year. It came on unmarked tyres. 09:33 First flying lap of the day for Mark Webber and he's straight into third in the Red Bull. 09:39 Van der Garde improves his time by a tenth. He's still the slowest of the seven cars that have set a time. The Dutchman is on the medium Pirellis. 09:42 Vergne gets down into the 1m23s for the first time today and remains second. A few seconds later Bianchi crosses the line to set his first time in a Marussia. 09:44 @officialsf1team: "To begin with, @EstebanGtz is doing aero work. Later in the programme are a qualifying and a race simulation." 09:47 @paulhembery: "Hamilton using prototype SOFT for his time. Tyres are identical to 2013 range, just back up production location." 09:49 A bit more info on Hamilton's tyres, in case you weren't around yesterday. The tyres are produced at Pirelli's Romanian plant as a back-up in case the rubber cannot be transported from its main Istanbul factory. Unmarked batches are brought to tests for quality testing. Each team has four sets, which do not count against their testing allocations. 09:50 Our technical guru Craig Scarborough has just arrived back from the pitlane and tells us that the Williams upgrades that arrived late this morning include Red Bull-style sidepods. We'll have a picture for you as soon as we can. 09:56 Red flag. Van der Garde's Caterham has stopped at Turn 6. 10:00 The recovery vehicles are already in attendance. Shouldn't be long before we're back underway. 10:02 @mycaterhamf1: Mechanical issue for @GvanderGarde stops him out on track just after starting his latest stint. 10:05 Not the usual dry-fuel run for van der Garde then, the team confirming it was a mechanical problem that stopped the car. No oil is being reported on the track. 10:06 We're back underway as Massa and Gutierrez head out, joined by Maldonado and Sutil. 10:10 Maldonado, new sidepods affixed, completes his first lap of the day. 10:12 Gutierrez goes second in the Sauber. He has medium tyres on. Perez and Bianchi also improve. 10:15 Another hot lap from Hamilton as he brings the top time down to a 1m20.817s. We'll check on what tyres he has on next time around. 10:16 Mediums for Hamilton that time. 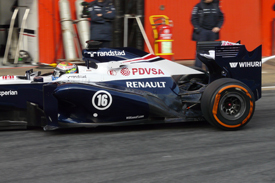 Here's a quick pic of the new Red Bull-style sidepods being used by Williams. 10:23 If you want to ask our resident technical oracle (we do seem to be elevating his status as the morning goes on) Craig Scarborough about the Williams sidepods, or any other technical matter, you can in 'Ask Scarbs' this afternoon. Tweet your questions to @autosportlive #AskScarbs or email live@autosport.com. 10:24 A big improvement from Gutierrez finds him a second on medium tyres. Hamilton's advantage is reduced to a still vast 1.9s. 10:25 @scarbsF1 "Mclaren are running their new front wing, they've aslo returned to the old vertical turning vanes under the nose." 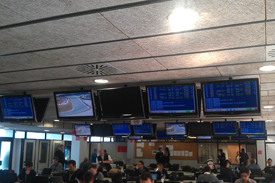 10:29 And we're in the dark for a few minutes as the timing screens in the press room decide to fail. 10:30 Not for long though. Our info is restored as Davide Valsecchi - in for the ill Kimi Raikkonen this morning, remember - sets his first time of the day, putting him ninth. 10:37 Massa finds three tenths and moves up to fourth spot. 10:41 Red Bull's earlier recce of the press room has resulted in Webber pulling into his pit stall far closer in to the garage itself than Vettel was doing yesterday. The mechanics are being doubly-quick with pushing the RB9 back into the garage too. 10:44 @rgrosjean: On my way to jump into my E21 in Barcelona. 10:49 Bianchi's first 'proper' lap on mediums is just 0.3s slower than team-mate Max Chilton managed in six days of driving here. Impressive. The Frenchman goes ninth. 10:50 Hamilton knocks nearly three tenths off his best time to improve his own marker at the head of the field. He's on the soft tyres. 10:50 We have a red flag. 10:51 Valsecchi's Lotus has stopped at the entrance to Turn 3. 11:02 @lotus_f1team: "Romain will be back in the car this afternoon for some bonus track time in the dry. On his was back from Paris now." 11:05 Finally Adrian Sutil gets a time on the board. He goes fourth quickest with it too. 11:08 Gutierrez and Massa improve ahead of him too. Both are on the yellow-marked soft tyres. Mark Webber is out on mediums. 11:09 Webber improves by a second. He's now on a best of 1m23.4s, a fraction behind Sutil. 11:15 After his earlier stoppage, Valsecchi is back out. So is Maldonado. These two have the least laps to their name of anyone today, just 11 and 20 respectively. 11:16 Valsecchi, on soft tyres, instantly improves to a 1m23.4s. That's 1.2s faster than his previous best and moves him up four spots to fifth. 11:23 Both Sauber and Caterham are testing supersofts at the moment. Gutierrez finds four tenths as he remains second. 11:28 It's all gone a bit quiet out on track, so here's a shadowy shot of Davide Valsecchi in his Lotus from this morning. 11:33 Sutil unleashes a belter of a lap to put himself third, just behind Massa. He's on softs. 11:41 Maldonado lifts himself off the foot of the timesheets with his first lap on softs. He's now third, the Venezuelan gaining over 3s on his previous best. Vergne also improves in seventh. 11:44 Sutil goes second, still 1.2s off Hamilton though. 11:46 Interesting that van der Garde's pace on his first lap on a set of supersofts was more or less identical to that on softs. 11:48 Supersofts for Vergne in the closing moments of the session. 11:49 Sutil improves to 1m21.627s. He's still second. 11:51 Sutil set his best time on the soft tyre, as did Hamilton earlier. 11:51 Massa now gets into the 1m21s. 11:53 Webber heads out with less than eight minutes to go. 11:55 Sutil is back out and appears to be on the Supersoft. 11:56 Webber improves, on the medium, with 1m23.116s. Hamilton heads out on track for the final three minutes. 11:57 And the Mercedes has come straight back in. 11:58 Sutil does a 1m21.774s on the Supersofts, a fraction off his earlier soft-tyred time. The Supersofts are giving up too early to give an advantage. 12:01 And that's it. No more improvements, so Hamilton ends up on top, his best over a second quicker than Sutil in second. 12:02 So the order at the end of the first morning with decent weather at the test this week is: Mercedes-Force India-Ferrari-Williams-Sauber. 12:04 It's the lunch break now. Thanks for joining us. Be sure to come back at 2pm Spanish time (1pm UK) for the afternoon session, when we expect some of the teams to try race runs. 12:05 Thanks also for all the Ask Scarbs questions we've been sent. He'll be answering them during the afternoon session. 12:58 The penultimate afternoon session is about to begin - when we can expect some more long runs from the teams. 13:04 The dry day today has been hugely important for teams, who are still trying to get a better understanding of their car and tyres ahead of the first race. 13:11 Well the time has come for 'Ask Scarbs'. Our technical guru Craig Scarborough has joined us and has picked out a list of your questions to answer. Let's get started. 13:13 Question 1. Bogata in Hungary asks: "Which teams do you expect to run with the passive DRS in Melbourne and whose looks the most promising?" 13:16 Will Crouch: Do you have an opinion on Marussia and Catherham's prospects relatively to each other and of finally getting some points? 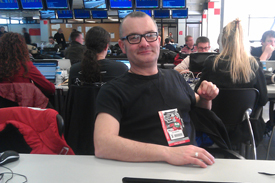 13:25 Phil from Germany: What is the main reason why Caterham and Marussia still struggle to make it to the midfield? Is it the aerodynamics or is it some major chassis/suspension problem? And why don't they just try to copy other teams' solutions? @scarbsf1:"The main reason is that F1 cars are so complex and integrated that it takes time to mature your design to the same level as the experienced teams. You can speed up this process with more money to buy more resources. Copying won't help, as although you can make a part that looks similar, you cannot understand exactly how it works and you end up being slower." 13:28 Anon: Looking at the passive DRS systems used by Lotus and Red Bull, which do you think is the better solution? 13:30 Matthias from Berlin: The launch-spec Williams had a very high nose. It seemed to me that the nose tip was far higher than the allowed 525mm above the reference plane. Is the Williams launch-spec nose really higher than 525mm and is this permitted? 13:33 Rick: Lewis Hamilton set a time this morning using "unmarked" tyres. What exactly are these tyres? 13:35 Simon: With all the talk of cost-cutting in F1, would it be a good idea to keep the same car for two years during a period of relative rules stability, rather than designing a new car every year? And how many of the 2013 cars are evolutions rather than clean slates? 13:37 We just have time for a few more questions with @scarbsF1 before he heads back to the pitlane to suss out more new technical innovations on the cars testing today. 13:38 Luffy: Can you describe the Coanda exhaust principle. Where did it get its name? 13:41 Gary Mah: Will the cars would be significantly slower next year as a result of the new regulations? Also, do you think the new regulations could help encourage more overtaking? 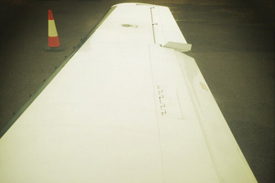 13:42 Si in Inverness: Is the passive blown-wing concept worth pursuing? Is it leading a few teams down a technical blind alley when they could be concentrating on other more important things? 13:43 That's all we've got time for on 'Ask Scarbs' today. A big thanks to all of you for sending in your questions. 13:43 No degradation problems for Hamilton as his lap time improves - from the 1m26s to the 1m24s. 14:12 Bottas now joins in on hards, Sutil comes in. 14:12 And the Force India blasts straight back out again as Sutil continues his 'race' run. 14:14 It looks like he is now on the hards. 14:14 Bottas has set his best time of the day on 1m23.830s. 14:16 Grosjean records a new best, 1m23.831s, on the mediums. 14:17 Gutierrez prepares to go out on the soft tyre. 14:18 And Grosjean's Lotus does a 1m23.482s. 14:19 Hamilton is now out on the mediums. 14:21 Massa records 1m21.505s to go second fastest. 14:24 Apart from the Ferrari, Hamilton is the fastest on track, in the 1m25s last time through. 14:24 After a slow lap, Massa bangs in a 1m22.6 on the softs, so the rubber has already lost a second. 14:28 Perez has also gone out, so now it is only Lotus and Marussia not on track. Massa comes in for a quick stop, straight back out. 14:30 Hamilton is still in the 1m26s, then a 1m27s. Looking pretty good. 14:31 Perez in. And Massa in, for longer this time. 14:32 Lotus sends Grosjean out. 14:32 Hamilton back in the 1m26s again, as Grosjean does a 1m23.566s, just shy of his best. 14:34 Grosjean improves to 1m23.380s. Vergne makes a quick stop. 14:36 Vergne is now on softs. Grosjean back in. He is still doing short runs. 14:38 Hamilton is now in. Sutil in the 1m27s on the hard tyre. 14:42 Sutil now in the 1m28s on his race run, the same as Vergne on softs. 14:42 Bottas out on mediums. 14:43 Massa is also heading down the pitlane. 14:43 Gutierrez in the 1m31s and 1m32s, now on hards. 14:43 Sutil gets back in the 1m27s. 14:44 Bottas laps just a fraction off his best and is currently the fastest on track. 14:45 The Williams is in, still short runs for Bottas. 14:46 And Massa improves again, to 1m21.457s, but is still second. Webber is currently out on hards. 14:48 As expected, Massa does a slow lap on the softs. Will he now try for a second quick lap like he did before? 14:50 He does, but it's still only a 1m22.975s. 14:51 Bianchi heads out after 45 minutes in the pits. 14:52 And he laps within a fraction of his best so far. Sutil is currently in the 1m29s. 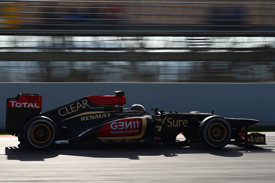 14:54 Grosjean has started a run on the hard tyres with 1m27s and 1m28s. 14:56 Sutil is now consistently in the 1m28s and 1m29s on his long run. 14:56 Grosjean is also in the 1m29s, but he hasn't been out anything like as long. 14:58 Hamilton heads back out in the pacesetting Mercedes. 14:58 Bottas is also back on track for Williams. 15:01 Massa also goes out, so the top three fastest cars from today are now circulating. 15:01 Hamilton does a 1m24.7 as Perez comes in. 15:02 And then a 1m26.8s, on the mediums. 15:03 Sutil comes in. It looks like that's the end of his long run. 15:04 Massa does a 1m21.609s, yet another quick run, but nobody can get anywhere near Hamilton's time from this morning. 15:04 Hamilton records 1m25.989s. Those two are the quickest currently on track. 15:07 Grosjean is now in the 1m30s, on hards for a longer run. 15:07 Webber is now out in the Red Bull. 15:10 Massa pits, Hamilton laps in 1m26.976s. 15:12 Grosjean pits. Webber is on the hards. Red Bull is clearly not bothered about chasing times at this stage. 15:13 Webber records 1m26.076s on the hards. 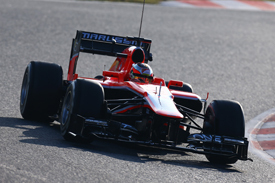 15:13 Bianchi improves his time, with 1m24.028s for Marussia. 15:14 Hamilton stops, Mercedes still doing shortish runs on the mediums. 15:14 Webber's next times on the hards are 1m27s and 1m28s. 15:15 Bottas shaves four thousandths off his previous best! 15:16 Bianchi pits after his short soft-tyre run. 15:19 Massa is back out and is on the Supersoft. Can he keep them alive long enough to improve on his soft time? 15:21 Massa's first two sectors were green, third one yellow as the tyres went away. 15:22 Vergne pits to end his race run. 15:23 Massa backs off for a lap, then goes again and records 1m23.2s. 15:27 Grosjean heads back out, joining Hamilton, Gutierrez and Perez on the circuit. 15:29 Bottas heads out too. 15:29 Hamilton is in the 1m25s on another of his medium-tyred runs. 15:31 Gutierrez pits. Bottas sets a new best of 1m22.613s on the soft tyres. 15:34 Bottas pits, Massa heads back out. 15:37 Massa goes again on the Supersoft and records 1m21.266s. 15:40 The session has been red-flagged with 20 minutes to go. Not yet sure why. 15:41 Massa has stopped out on the circuit. 15:48 We're getting suggestions that a wheel came off, although the CCTV didn't pick it up, so we can't yet confirm. 15:49 Yes, picture confirmation shows that a wheel came off on the back straight. 15:53 And we're back on again with just seven minutes to go. 15:56 Quite a few cars, including Hamilton head back out. 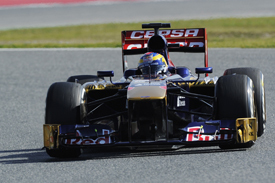 Webber, on softs, does a 1m22.658s. 15:56 Bottas and van der Garde have also set personal bests. 15:59 Hamilton again in the 1m24s and 1m25s on the hard tyres, but the initial flurry after the restart is subsiding. 16:00 And Webber takes the chequered flag. Day three is over. Just one more pre-season day of running to go! 16:02 So Hamilton's morning time remained easily quickest, with Massa moving up to second in the afternoon. The Ferrari driver's 1m21.266s lap on supersofts was fastest after lunch. 16:03 Mercedes-Ferrari-Force India-Williams. Both Williams drivers in the top five, with just over a tenth between them. 16:03 Thanks for joining us and be sure to look out for our news and analysis later this evening and tomorrow morning. 16:04 We will, of course, be back again first thing tomorrow to bring you the final, crucial, day of testing before the Australian GP. 16:30 Final word today. If you want a quick summary of the third day of testing, have a look at our report.